Suitable for installation in any bathroom or kitchen, our Centrefeed Paper Towel Dispenser in Brilliant White securely holds your centrefeed paper away from damaging moisture or powerful little hands. Designed for wall mounting at the appropriate high, the ABS plastic construction promises an extended durability that can be easily wiped clean with disinfectant wipes to maintain your cross-contamination prevention program. 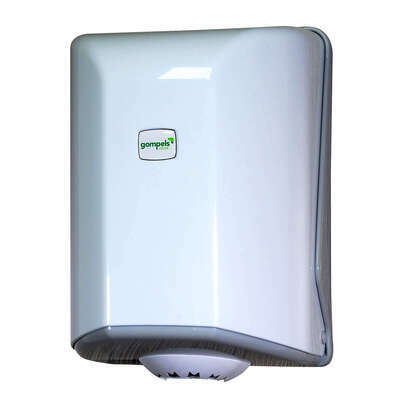 Easy to load with its hinged opening, this towel dispenser is compatible with all mini-jumbo and jumbo centrefeed rolls and has a serrated paper release portal that easily tears paper at your desired length without putting fingers at risk of injury. Discretely pack away clumpy looking rolls with this sleek design that promises to sit easily within any room décor. This functional dispenser is compatible with our Everyday Blue Centrefeed and Everyday White Centrefeed rolls as well as Premium Centrefeed rolls and Mini Jumbo rolls.